Getting drugs into the eye is a challenge. The most effective solutions tend to be unpleasant and involve actual injections into the eyeball. If doctors deliver the injection in a less horrifying part of the body, it can take a dangerously high initial dose to ensure that enough of the drug actually reaches the eye. Eye drops tend to wash out, and they’re surprisingly inefficient: the eye only absorbs about five percent of the drug most of the time. For some patients, these tradeoffs lead to a choice between needles and blindness. Some recent ideas have focused on contact lens-like hydrogels that keep drugs on the surface of the eye longer than eye drops to surgically implant tiny drug reservoirs into the eye. 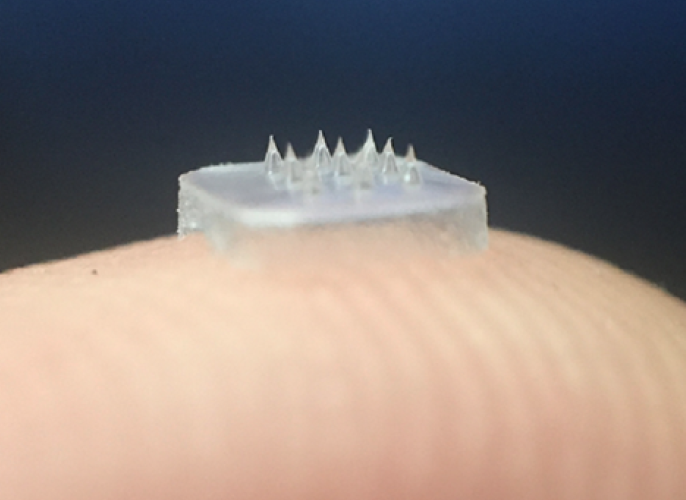 Others have involved microneedles: pyramid-shaped needles just a few hundred micrometers long. Microneedles have been increasingly popular as a less-painful way to get drugs through a patient’s skin without an injection—they’ve been used to deliver vaccinations, local anesthetics, and anti-diabetic medications.